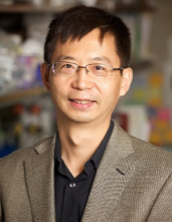 The lab of Salk Professor Reuben Shaw showed that late-stage cancers can trigger AMPK’s cellular recycling signal to cannibalize pieces of the cell, supplying large lung tumors with the nutrients they need to grow. Grant is part of a total $43 million commitment from American Heart Association-Allen Initiative to find as yet unknown causes associated with decline of thinking and memory. Salk Institute researchers have been awarded $19.2 million to study age-related cognitive decline caused by Alzheimer's disease and similar conditions that affect thinking and memory. Salk scientists are developing new methods to study old and diseased brain cells. These include rudimentary brain "organoids," cell cultures and models of aging. These will be studied with data techniques to identify the cells and pathways most involved in brain aging. Numerous attempts to stop Alzheimer's have focused on relieving specific conditions, such as by reducing accumulation of toxic proteins called beta amyloid and tau. None of these has demonstrated more than a very modest effect -- too modest to cure the disease or even stop it from progressing. Alzheimer's is known to be associated with a number of factors, including some genetically linked. However, the most widespread and consistent association is with age itself.